Preheat the grill to high. Spoon the crème fraîche into a medium saucepan. Stir in 1 tsp mustard then drop in the fish and prawns. Bring to a simmer, cover and cook gently for 5 minutes or until the fish flakes easily and the prawns are pink and cooked through. Spoon the fish out of the sauce and into a small baking dish. 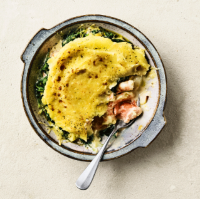 Stir the spinach and 25g cheese into the remaining cream sauce, then pour it over the fish. Stir 1 tsp mustard into the mashed potato and spoon then swirl it over the fish. Scatter with the remaining cheese. Grill for 5 minutes, or until the mash is golden and serve with sugar snap peas.